This tutorial was written by Jenny on 7-30-2009. Resemblance to any other tutorial is purely coincidental and unintentional. I am using the artwork of Suzanne Woolcott. You need a license to use her artwork and you can purchase her artwork HERE. 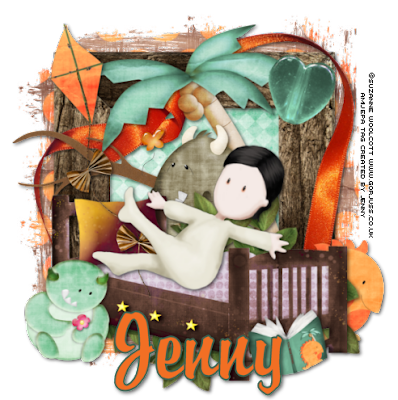 Copy & Paste deco frame, resize 50%. Copy & Paste paper of choice, resize 50%, place below frame. Select inside frame with magic wand, selections,modify, expand 10, selections,invert, delete on paper layer, select none, add drop shadow to frame. Copy & Paste doodle A as a new layer, move below frame layer, add drop shadow. Copy & Paste ribbon, resize 50% then again 65%, move below frame but above paper, add drop shadow, use eraser tool to erase excess of ribbon. Copy & Paste doodle B as a new layer, mirror, resize 75%, add drop shadow, place above doodle A layer. Copy & Paste beads, resize 50% twice, add drop shadow, move below frame and paper. Copy & Paste Paisley Flower as a new layer, resize 75%, add drop shadow, move below frame and paper layer and off to the left. Copy & Paste Rainbow as a new layer, resize to your liking, place below frame and ribbon. Copy & Paste wordart of choice, resize to your liking, place at the top of your canvas, add drop shadow. Copy & Paste bird of choice, resize to your liking, add drop shadow and place on the frame. Hide the wordart, tube, background, mask layer, merge the other layers visible, move the merged layer over to the right a little bit, unhide the other layers. Resize canvas if you'd like. Add copyright info and text and you are done. 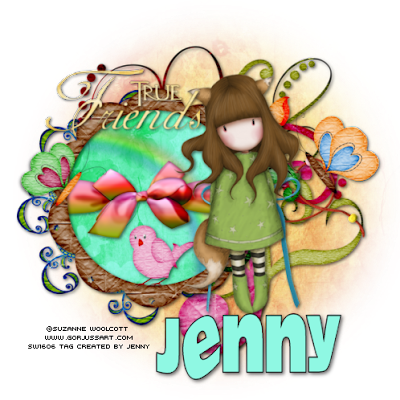 This tutorial was written by Jenny on 7-29-2009. Resemblance to any other tutorial is purely coincidental and unintentional. I am using the artwork of Suzanne Woolcott. I purchased by tubes through AMI. You can now purchase her artwork/tubes HERE. Open new canvas 600 x 600. Flood fill white. New raster layer, select with magic wand, copy & paste pp05 into selection, select none, apply mask. Copy & Paste frame05 as a new layer, resize 80%, add drop shadow of choice. Copy & Paste pp09 as a new layer, resize 75%, move below frame, use selection tool and draw around frame, selections,invert,delete on paper layer, select none. Copy & Paste greens06 as a new layer, resize 75%, place at the bottom of the frame, add drop shadow. Copy & Paste bed as a new layer, resize 75%, add drop shadow, see my tag for placement. Copy & Paste ribbon 01 as a new layer, resize 75%, move below the greens layer, add drop shadow. Copy & Paste kite as a new layer, resize 65%, place on the left corner of the frame. Copy & Paste bead as a new layer, resize 75%, place on the right corner of the frame, free rotate right 15 degrees. Copy & Paste each monster as a new layer, placing to your liking, resize each 50% then again 65% and add drop shadow to each. Copy & Paste branch as a new layer, resize 50%, see my tag for placement, add drop shadow. Copy & Paste palm tree as a new layer, resize 65%, add drop shadow, see my tag for placement. Copy & Paste tube placing it on the bed and resizing as needed. Copy & Paste book, resize to your liking, place to your liking, add drop shadow. Now you can resize the canvas if you'd like. Then add your copyright info and text and you are done. I closed off the white background and saved as a PNG. 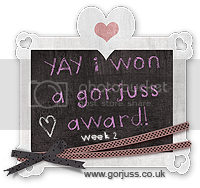 I Won A Gorjuss Award!!!! Woohooo how happy am I? VERY!!!! and the Gorjuss Forum HERE. 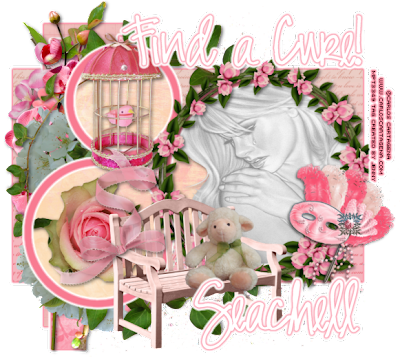 I am using a scrapkit called Outshine by PolkaDot Scraps. It's an awesome kit. I'm also using artwork by Suzanne Woolcott, of course. 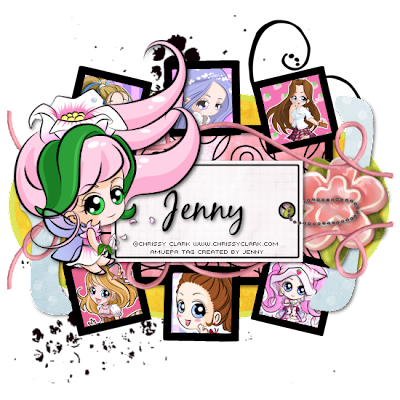 This tutorial was written by Jenny on 7-22-2009. Resemblance to any other tutorial is purely coincidental and unintentional. I am using the wonderful artwork of Irene Shpak. You need a license to use this artwork. I have a license from MyPSPTubes. New raster layer, select with magic wand,copy & paste paper10 into selection, select none, apply mask. Copy & Paste frame08 as a new layer, resize 85%, move it over just a bit to the right. Copy & Paste Paper14 as a new layer, move below frame08, resize 85%. Copy & Paste tube or image of choice as a new layer, resize to your liking, move below frame. Using the magic wand select inside the frame, selections,modify, expand 6, selections, invert,delete on the tube layer, delete on the paper layer, select none, merge frame,tube and paper visible. Copy & Paste doodle04 as a new layer, resize 85%, move below frame and over to the right, duplicate,mirror,flip. Copy & Paste doodle07 as a new layer, move below frame and toward the bottom, duplicate, mirror, flip. Copy & Paste frame13 as a new layer, resize 85%, move above mask layer, duplicate,flip. Copy & Paste doodle01 as a new layer, resize 75%, place below frame and to the right top, duplicate,mirror,flip. Copy & Paste musicnotes01 as a new layer, place above frame and toward the bottom. Copy & Paste ribbon01 as a new layer, place below musicnotes01. Copy & Paste flower02 as a new layer, resize 65%, place on the frame at the bottom right. Copy & Paste jewel01 as a new layer, resize to your liking, free rotate 30 degrees right, adjust sharpen, add drop shadow, place above flower02 layer. Copy & Paste jewel03 as a new layer, resize to your liking and place close to the jewel01 layer. Copy & Paste candles01 as a new layer, resize 65%, place below frame but toward the top so that the flames are sticking out, duplicate, mirror, merge these two layers only visible, duplicate,flip. Resize your canvas if you'd like. I also closed off the white layer so I could save as a transparent PNG. Add copyright info and text and you are done. 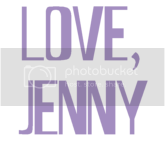 This tutorial was written by Jenny on 7-21-09. Resemblance to any other tutorial is purely coinicidental and unintentional. I am using the artwork of Suzanne Woolcott. I hold a license for this tubes through AMI. You can now purchase Suzanne's awesome artwork HERE. This kit was a limited time freebie at Twilight Scraps and is now available for purchase. (The photo I am using is from a member of the Just Gorjuss Forum, Kristie. The photo was a part of a challenge and inspired this tut. Please feel free to use any photo you wish in this tut. Flood fill white, new raster layer, select with magic wand, copy & paste paper10 into selection, select none, apply mask. Copy & Paste frame1 as a new layer, resize 65%. Copy & Paste photo of choice, resize to your liking, move below frame. Merge frame and photo only visible. Copy & Paste frame4 as a new layer, resize 65%, see my tag for placement, you will want to use the eraser tool to erase the left side of the frame so that it looks like the chain is hanging onto the frame1 layer. Merge this layer with the framed photo layer. You may want to move this layer upward just a bit. Copy & Paste button2 as a new layer, resize 50% twice then again 65%, add drop shadow, place top right corner of frame. Copy & Paste ribbon2 as a new layer, resize 65%, place at the bottom of the frame, add drop shadow. If you have the goose/geese and want to apply it/them then you may do so now, resizing to your liking and placing at the top of the frame. If you don't have it, this kit has several items to choose from that you could use instead. Copy & Paste flowerbunch2 as a new layer, resize 50% then 65%, place to the left bottom of the frame, duplicate, free rotate 8 degrees left,duplicate,mirror, then bunch them all together. Copy & Paste grass2 as a new layer, resize 75%, see my tag for placement, I duplicated about 4 times, stacking each layer on top of the other. Copy & Paste fire as a new layer, resize 50% then again 70%, place toward the bottom left of the canvas. see my tag. Copy & Paste bench as a new layer, resize 65%, move to the right of the canvas. Copy & Paste your tube as a new layer, resize to liking and place on bench. Copy & Paste flower3 as a new layer, resize 50% twice then again 85%, place at the bottom of the bench. You're almost done.....Resize your canvas if you'd like. I resized mine 77%. This tutorial was written by Jenny on 7-20-2009. Resemblance to any other tutorial is purely coincidental and unintentional. I am using the artwork of Carlos Cartagena. You need a license to use this artwork. You can purchase the tubes at MyPSPTubes. 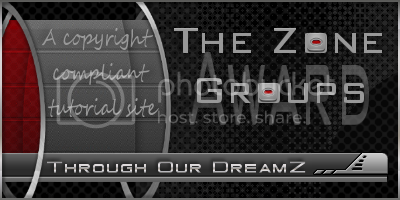 *I received this tube through a MPT Mad Flash Giveaway on 5-19-2008. Open the tagtemplate, close credit layer, shift d to duplicate, close original. Select large rectangle with magic wand, copy & paste Paper5 as a new layer, resize 70%, selections,invert,delete,select none, hide original layer, effects, plugins, Eye Candy, Gradient Glow, Glow Width 5.00, Color Fat and choose a color from the kit, apply. You will use this same setting each time you use the gradient glow in this tut. Select rectangle with magic wand, copy & paste Paper4 as a new layer, resize 70%, selections,invert,delete, select none, hide original layer, effects, plugins, Eye Candy, Gradient Glow. Select rectangle2 with magic wand, copy & paste Paper1 as a new layer, resize 70%, selections,invert,delete,select none, hide original layer, effects, plugins, Eye Candy, Gradient Glow. Select rectangle3 with magic wand, copy & paste Paper3 as a new layer, resize 70%, selections,invert,delete,select none, hide original layer, effects, plugin, Eye Candy, Gradient Glow. Select frame background with magic wand, copy & paste Paper8 as a new layer, resize 70%, selections,invert,delete,select none, hide original layer. Select circle frames with magic wand, new raster layer, flood fill with color from your kit,select none, hide original layer, effects,plugin,Eye Candy, Gradient Glow. Copy & Paste tube of choice as a new layer, resize if needed, place in the biggest circle, use the eraser tool to remove any excess, add drop shadow to tube. Copy & Paste Element16 (flower wreath) as a new layer, resize 50% then again 85%, place over large circle frame, add drop shadow. Merge visible the flower wreath,circle frames, tube and Paper8 layer and rename circle framed. Copy & Paste Element49 (pink face mask) as a new layer, resize to your liking, mirror and see my tag for placement. Copy & Paste Element37 (rain rose) as a new layer, resize to your liking,add drop shadow and place in the circle frame at the bottom. Copy & Paste Element14 (bird cage) as a new layer, resize to your liking, place as though it looks like it's hanging off the top circle frame, add drop shadow. Copy & Paste Element52 (bench) as a new layer, resize 5o% then again 65%, see my tag for placement. Copy & Paste Element60 (lamb) as a new layer, resize to your liking and place on the bench. Copy & Paste Element32 (glitter dust) as a new layer, resize to your liking and move to the bottom. 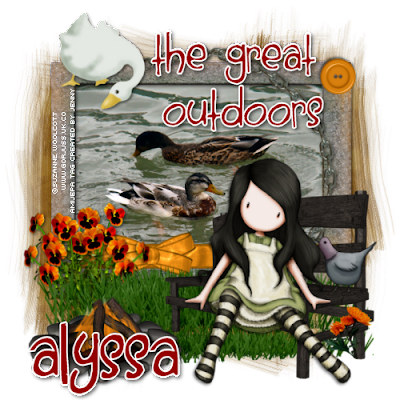 Copy & Paste Element70 (bow ribbon) as a new layer, add drop shadow, resize to your liking and place on the bench. Copy & Paste Element18 as a new layer, resize 50%, add drop shadow, move below circle framed and to the left, see my tag. Copy & Paste Element2 as a new layer, free rotate 90 degrees right, resize 75%,add drop shadow, place above previous layer. Copy & Paste Element1 as a new layer, add drop shadow, place above previous layer. Copy & Paste Element19 as a new layer, resize 55%, add drop shadow, place toward the top above previous layer, duplicate, flip. Copy & Paste Element69 as a new layer, free rotate 90 degrees right, resize 75%, add drop shadow, place above previous layer. Add copyright info and text and you are done. I also added the same gradient glow to my text and closed the white background layer to save as a transparent PNG. This tutorial was written by Jenny on 7-19-2009. Resemblance to any other tutorial is purely coincidental and unintentional. I am using the artwork of Susan McKivergan. You need a license to use her artwork. 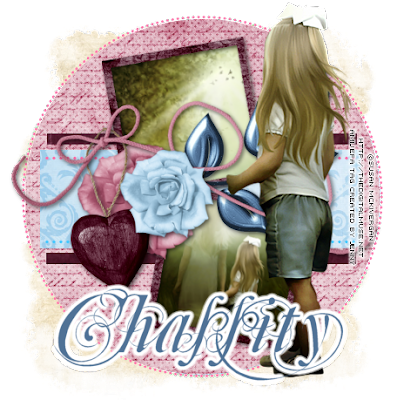 I am licensed through Artistic Minds Inc.
Open the tagtemplate232 by Missy. Close the credit layer, shift d to duplicate and close the original. New Raster layer, select with magic wand, copy & paste paper6 into selection, select none, apply mask, duplicate mask layer. Select the Circle layer with your magic wand, copy & paste paper18 as a new layer, resize 60%, selections,invert,delete,select none, close original layer. Select thin rectangle1 and thin rectangle 2 with your magic wand, copy & paste paper15 as a new layer, resize 60%, selections,invert,delete,select none, close original layer. Select thin rectangle 3 with magic wand, copy & paste paper2 as a new layer, resize 60%, selections,invert,delete,select none, close original layer. Select frame 1 background and frame 2 background with magic wand, copy & paste image of choice as a new layer, resize if needed, selections,invert,delete, select none, close original layer. (with mine I free rotated the image 8 degrees before selecting the backgrounds- it just depends on what kind of image you're using). Select frame 1 and frame 2 with magic wand, copy & paste paper10 as a new layer, resize 60%, selections,invert,delete,select none, add drop shadow,close original. Copy & Paste element27 as a new layer, resize 55% then again 85%, add drop shadow, place between the frames like I have mine. Copy & Paste element26 as a new layer, resize 55% then again 65%, add drop shadow, place above elemetn27 like I have mine. Copy & Paste element32 as a new layer, resize 65%, add drop shadow, place below the 2 previous elements. Copy & Paste element17 as a new layer, resize 85%, add drop shadow, place below element26 layer (the blue rose). Copy & Paste element54 as a new layer, resize 50%, move below element17 layer (pink ribbon bow), add drop shadow. Copy & Paste tube of choice, resize if needed, place to the right or left of your canvas. Add copyright info and text and you're done. I used a fat gradient glow of 5 on my text. I closed off the white background layer and saved as a PNG. This tutorial was written by Jenny on 7-18-2009. Resemblance to any other tutorial is purely coincidental and unintentional. I am using the artwork of Chrissy Clark. You need a license to use her artwork. 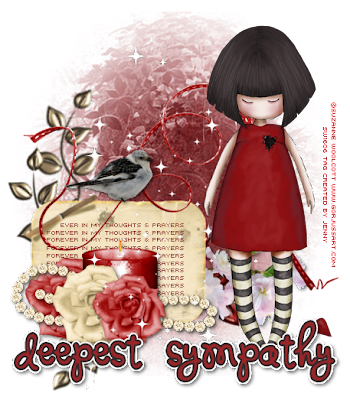 I am licensed through Artistic Minds Inc.
Open Template, close credit layer, shift d to duplicate and close the original. Select Grey Oval with magic wand, copy & paste pp4 as a new layer, resize 50% twice then again 65%, selections,invert,delete, select none, hide original layer. Select Pink Oval with magic wand, copy & paste pp5 as a new layer, resize 50% twice then again 65%, selections,invert,delete,select none, hide original layer. Select rectangle layer with magic wand, Copy & Paste pp2 as a new layer, resize 50% twice then again 65%, selections,invert,delete, select none, hide original layer. Select rectangle frame with magic wand, new raster layer, flood fill black, select none, add drop shadow, hide original frame. Select the square with magic wand, copy & paste image as a new layer, resize to your liking, selections,invert,delete on image layer, select none. Once you have filled all squares, hide original square layer. Select white frames with magic wand, new raster layer, flood fill black, select none, drop shadow, hide original layer. Select right and left bracket with magic wand, copy & paste pp3 as a new layer, resize 50% twice then again 65%, selections,invert,delete, select none, hide original layer. Copy & Paste string as a new layer, resize 50% twice then again 75%, place on bottom of top frames, see my tag, duplicate, flip. Copy & Paste flower 3 as a new layer, resize 50% twice, add drop shadow, place to the right of the canvas. Copy & Paste flower2 as a new layer, resize 50% three times, place below flower 3. Copy & Paste tag as a new layer, resize to your liking, see my tag for placement. Copy & Paste tube as a new layer, resize if needed, see my tag for placement, add drop shadow. Copy & Paste bubbletexture as a new layer, move to the bottom, resize 50% twice then 85%. Copy & Paste doodlestems as a new layer, resize 50% then again 65%, move to the bottom and to the right, see my tag. Resize tag if needed. Add copyright info and text and you are done. I saved mine as a transparent PNG if you wish not to do that then you will need to add a new raster layer, flood fill white and move to the bottom. This tutorial was written by Jenny on 7-18-2009. Resemblance to any other tutorial is purely coincidental and unintentional. I am using the artwork of Amanda Fontaine. You need a license to use her artwork. I'm licensed with these tubes from Artistic Minds Inc. You can now purchase her tubes HERE. Open templat86, hide credit layer, shift d to duplicate and close the original. New raster layer, flood fill white, move to the bottom. New raster layer, flood fill with a color from your scrap, move above white layer, apply mask. I closed off the white layer after applying the mask so that I could save it as a transparent PNG. Select blue strip with magic wand, copy & paste Paper16 as a new layer, selections,invert,delete,select none, hide original layer. Select grey strip with magic wand, copy & paste Paper16 as a new layer, selections,invert,delete,select none, hide original layer. Select black strip with magic wand, copy & paste Paper10 as a new layer, selections,invert,delete,select none, hide original layer. Copy & Paste bloom2 as a new layer, resize 75%, move up to the left top corner above the 3 strip layers. Copy & Paste Metal leaf doodle2 as a new layer, resize 80%, duplicate,image,mirror,flip. Select Blue Rounded Rectangle with your magic wand, copy & paste Paper11 as a new layer, resize 85%, selections,invert,delete,select none, hide original layer. Select Black Rectangle with magic wand, copy & paste Paper4 as a new layer, resize 75%, selections,invert,delete,select none, hide original layer. Select Grey Circle with magic wand, copy & paste Paper5 as a new layer, resize 50%,selections,invert,delete,select none, hide original layer. Now you'll want to go back and select each frame with the magic wand (individulally of course), new raster layer each time, flood fill with a different color from the color used inside the frame, see my tag, select none each time and hide the original layer(s), add drop shadow to each frame layer. Copy & Paste Sequin Mess 1 as a new layer, resize if needed, place above all frame layers but below the circle layer. You may want to take the eraser tool and remove the several sequins at the bottom that are cut off. Copy & Paste Elegant Wrap 3 as a new layer, place on the Rectangle frame layer, resize 50% then again 75%, move down a bit. Copy & Paste Pocket Watch, resize to your liking, free rotate 15 degrees right, place below circle layer, see my tag. Copy & Paste Keys1 as a new layer, resize to your liking and place on the Rounded Rectangle frame. See my tag. Copy & Paste Daisy 1 as a new layer, resize 75%, add drop shadow, place on the circle. Copy & Paste one tube place under the rounded rectangle frame layer, drop the opacity to around 70, use the selection tool to remove any excess tube sticking out from the frame. Copy & Paste the other tube as a new layer, resize if needed, place toward bottom of canvas, see my tag, add drop shadow to tube. Resize or crop the tag if you'd like. Add copyright layer and text. And you are done. Just wanted to stop by and let you all know I appreciate your support and the love you drop off to me. I'm glad you enjoy doing my tuts. However, due to some unseen issues here at home I'm having to take a small break. It may be a couple of days, it may be a couple of weeks. I just don't know as of right now. I'm extremely upset and can barely be on the computer at all for any length of time. I appreciate your support and hope you all understand that I will go back to tut writing very soon. I'm in no way giving it up, just taking a small break. This tutorial was written by Jenny on 7-2-2009. Resemblance to any other tutorial is purely coincidental and unintentional. I am using the artwork of Lacy Clagg. You need a license to use her artwork. I am licensed to this image through LCTS. Open Template. Close credit layer, shift d to duplicate and close original. Select Dark Circle layer with magic wand, copy & paste Bkg5 as a new layer, resize 75%, selections,invert, delete,select none, hide original layer. Select light circle layer with magic wand, copy & paste Bkg9 as a new layer, resize 75%, selections,invert,delete,select none, hide original layer. Select rectangle layer with magic wand, copy & paste Bkg11 as a new layer, resize 75%, selections, invert,delete, select none, hide original layer. Select rectangle frame with magic wand, copy & paste Bkg2 as a new layer, resize 75%, selections,invert,delete, select none, add drop shadow, hide original layer. Select squares with magic wand, copy & paste Bkg8 as a new layer, resize 75%, selections,invert,delete,select none, hide original layer. On the swirls layer, select all, float,defloat, copy & paste Bkg3 as a new layer, selections,invert,delete, select none, add drop shadow, hide original layer. Select square frames with magic wand, copy & paste Bkg13 as a new layer, selections,invert,delete, select none, add drop shadow, hide original layer. Select sm top circle with magic wand, copy & paste Bkg1 as a new layer, resize 50%, selections,invert,delete, select none, add drop shadow, hide original layer. Copy & Paste tube as a new layer, resize if needed, place below square frame, use your selection tool to draw around frame, selections,invert, delete on tube layer, add drop shadow to tube. Repeat this step on the other 2 frames using a different tube from the same artist if you want. Copy & Paste cloud as a new layer, see my tag for placement. Copy & Paste ribbon as a new layer, resize if you want, place on the left frame, add drop shadow. Copy & Paste dock as a new layer, resize 70%, add drop shadow, see my tag for placement. Copy & Paste Seagull as a new layer, resize to your liking and place ontop the dock, add drop shadow. Copy & Paste lillies and cattails as a new layer, resize to your liking, add drop shadow, place by the dock, see my tag. Copy & Paste laying down tube as a new layer, resize if needed, add drop shadow, place infront of dock. See my tag. Copy & Paste tropicaldrink1 as a new layer, resize 50% then again 50%, add drop shadow, mirror and place so that it looks like the girl is touching or holding the drink. Place seachells on the dock. Add copyright info and text and you are done. I saved mine as a PNG.